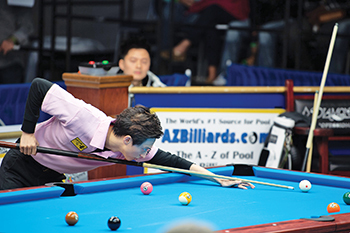 The inaugural International 9-Ball Open was a truly global affair, with a pair of Taiwanese stars meeting in the final. Sitting in the main arena at the International 9-Ball Open, Taiwan's Jun-Ling Chang started to feel like it wasn't his night. 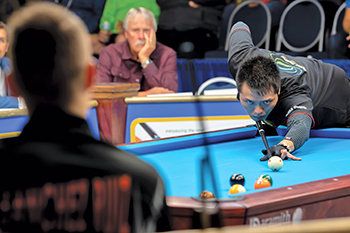 Thanks to a couple of fortunate rolls and a pocketed 9-ball on the break, opponent and fellow countryman Ping-Chung Ko had built an 11-7 advantage in the race-to-13 championship match. Just about the time that Chang was coming to terms with his potential defeat, his fortunes slowly twisted in the opposite direction. Thanks to some smooth shot making coupled with a handful of errors by Ko down the stretch, the 33-year-old from Chinese Taipei gutted out a 13-11 come-from-behind victory in October's inaugural event at Norfolk's Sheraton Waterside. "When he made the bank shot in the side pocket I thought, 'Maybe it's not my day. Maybe I'll give up,'" Chang said after the match through a translator. "But when Ko had his scratch (on the break at 11-7), I thought, 'the gods are fair.'" Chang battled back from the one-loss side to take top honors in the loaded field of 113 players, with 76 of those hailing from 27 different countries. 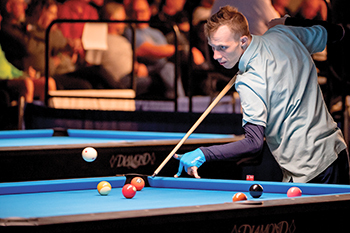 The victory and subsequent $40,000 pay day helped ease the frustration of some previous near misses at the popular Virginia event when it was still named the U.S. Open 9-Ball Championships. He finished second to Shane Van Boening in 2016, finished fourth in the event last year and placed seventh in 2012. 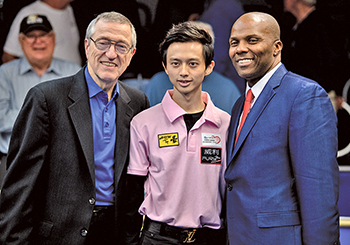 After opening competition by gutting out close wins against Duong Hoang and Billiards Congress of America Hall of Famer Rodney Morris, Chang's game appeared to strengthen as the tournament progressed. He bested reigning Mosconi Cup Most Valuable Player Joshua Filler, 11-5, then survived against Dennis Orcullo, 11-8, and defeated reigning U.S. Open 9-Ball Champion Jayson Shaw, 11-5. Chang punched his ticket for Saturday's semifinals with a convincing 11-4 defeat of Spain's Francisco Sanchez-Ruiz. Waiting for Chang in the winner's side finals was Ko, the less-heralded but lethal 23-year-old brother of former world champion Pin-Yi Ko. The two players traded games in the early stages of the match. Chang pulled ahead, 5-4, in the race-to-11 format but misplayed a push after the break and watched as Ko used an impressive break shot and some creative safety play to rattle off seven consecutive games to advance to the finals, 11-5. Chang headed to the loser's bracket to face arguably the hottest player in the tournament: Skyler Woodward. After losing his fifth match of the event, Woodward was making a hobby of quickly dismantling big-name opponents — eliminating Russia's Fedor Gorst, 11-2; Justin Bergman, 11-3; Estonia's Denis Grabe, 11-3; and Van Boening, 11-5. "He was breaking better than everybody and it wasn't even close," said Bergman. In the first half of the match it appeared that Chang would be the one making quick work of an opponent. Using three victorious safety battles, three run-outs and a missed shot by Woodward, Chang built a nearly insurmountable 8-0 lead in a race-to-11. More than halfway through the match Chang had an Accu-Stats Total Performance Average of a staggering .940 while his opponent registered .000. "I was just waiting for my turn," Woodward said. "I know if I break well I have a chance." Victor Chang (center) was joined by the Ko brothers (on Chang's left) and the rest of the Taiwanese contingent to celebrate their dominance. He got his opportunity in the ninth game when Chang showed he was, in fact, human when he left an open shot after exchanging safeties. Woodward won that game and, after a victorious safety battle by Woodward in the 10th game, a run out in the 11th and miss by Chang in the 12th game, cut the lead in half, 8-4. When Chang scratched again in the 13th game, Woodward cleared the table, then broke and ran in the next game to cut the lead to 8-6. Following a combination shot on the 9 after the break in the next game, the Kentuckian was suddenly down a single game. "I was going to be very upset with myself if I let this match slip away," Chang said. With a chance to tie the match, Woodward had an awkward angle on the 4 ball and attempted a rail-first shot, leaving the 4 in the jaws of the corner pocket. Chang immediately called for an intermission after the miss because he felt drained from sitting. "I was feeling a little bit dizzy and had low blood sugar and wanted to take a time out," Chang said. While his opponent left the arena to refresh himself Woodward was left sitting in his chair with the missed ball sitting on the table six feet away. Chang cleared the rack to take a 9-7 lead then took advantage of a Woodward foul to climb onto the hill, 10-7. Woodward used a scratch on the break and a missed 2 ball by Chang to cut the lead to 10-9, but lost the 20th game after misplaying a safety. "I saw it and there was enough space that I could kick and knock it to the other side of the table and I hit it on the side," said Woodward of the dangling 4 ball. "I didn't hit it full enough. I had a chance. I just hit it bad." Woodward's efforts were good enough for third place, his best finish at this venue. Known early in his career for his proficiency on bar tables more than regulation-sized equipment, he feels this performance should serve as proof — both for opponents and himself — that he's one of the top young players in the game. "It's where I always dreamed to be — one of the best," Woodward said. "This weekend really shows that I can really do something. I can really play with the best of them." Two hours after eliminating Woodward, Chang squared off again against Ko in the finals. If the sport was boxing or one-on-one basketball, the final would have looked like a mismatch, with the diminutive Ko standing in at 5-foot-5 and weighing about 100 pounds while Chang stood a foot taller and 100 pounds heavier. From an ability and strategy standpoint, the early stages of the match looked like a title fight, with the two players landing shots when available and approaching play more conservatively when they weren't. Chang took advantage of Ko scratching on the break in the first game and misplaying a safety in the second to take a quick 2-0 lead. Ko responded with a successful combination shot, a successful safety battle and a break-and-run to jump ahead, 3-2. And so it went for the first half of the match, with the two players trading run outs, illegal breaks and safeties. After 14 racks, Ko and Chang were tied at seven games each. Then luck seemed to come and sit with Ko, who reclaimed the lead 8-7 after running out following a scratch on the break. He followed with a break-and-run to add to his lead. Ko broke dry in the 17th game but found himself at the table again after Chang missed the 3 ball. He miscued on a shot on the 4 ball but watched as the mishit object ball bounced off the end rail and fell into the opposite side pocket. Ko cleared the rack, then pocketed the 9 ball on the break in the next game to build an 11-7 advantage. Ko's luck then vanished just as quickly as it appeared. He came to the table in each of the next four games and his four appearances yielded a pair of scratches, a missed shot and a misplayed safety. In no time at all, Ko's four-game lead had vanished. "At 11-9 I felt a little bit of pressure because I had a decent shot but I couldn't make it because of pressure," Ko said after the match through a translator. "But I had my opportunities." Ko missed a tough cut shot on the 1 ball in the 23rd game and wouldn't challenge again, as Chang cleared the table, then used pinpoint positioning in the final game to navigate a tricky layout. As victory became inevitable, the normally reserved Chang let out a celebratory yell to a slightly surprised crowd in the Sheraton ballroom. "I had been feeling some pressure, so I yelled to relieve that," Chang joked. Ko's runner-up performance was good enough for a $20,000 pay day. The young man notched convincing victories against Albin Ouschan, Grabe and a memorable, come-from-behind performance against Van Boening. The South Dakotan used six run-outs from the break to build a 10-6 lead in a race-to-11. At the table and needing just one more rack to advance, however, Van Boening scratched in the corner pocket on the break. Ping-Chun Ko (with older brother Pin-Yi watching) raced past his countryman in the winner's bracket final. "I didn't think I did anything wrong. The cue ball just caromed off the 9 and went in the corner," Van Boening said. "There wasn't much that I could do." Van Boening went back to his chair and sat down. The next time he got out of his seat was to congratulate Ko, who broke and ran six straight racks to defeat the five-time U.S. Open champion, 11-10. "When I was down 10-6, all I was thinking was, 'One rack-at-a-time,'" Ko said. "Then it eventually became hill-hill. I just did the best that I could." In hindsight, Van Boening thinks calling a timeout shortly after the scratch to potentially ice his opponent may have worked to his advantage. "I think it was my mistake that I didn't take a bathroom break so that the momentum could have stayed on my side," he said. Van Boening made his way to the one-loss side of the bracket, where he opened his Friday with a morning match against England's Chris Melling. With the score knotted at four games each, Melling appeared positioned to retake the lead in the ninth game but miscued on the 6 ball. The equipment malfunction allowed Van Boening to clear the rack, then win four of the following five games to take a 9-5 lead. Melling battled back, evening the score at 10-10 but failed to pocket a ball on the break in the deciding game. Van Boening zig-zagged the cue ball up and down the table for position to win the match, 11-10. "I just feel like I've played as well as he played," Melling said. "I miscued. He's missed more balls than I missed, but I didn't seem to land on any balls after the break." The eighth-place finish was a career-best in Norfolk for Melling, who had hoped that the strong finish along with victories at this year's Derby City Classic in the 9-ball division as well as top honors in August's World Pool Series event would be enough to land him on the European Mosconi Cup team as a wild card selection. A week after the event concluded, Matchroom announced that Ouschan and Shaw had been selected to complete the five-man roster. Back in action, Bergman jumped into the top eight with a string of impressive wins, including an 11-7 win to oust defending champ Jayson Shaw. While Melling packed his cue, Van Boening advanced to face Orcullo. The South Dakotan jumped out to an early 5-0 lead, but the Filipino took a break, slowed down his pace and clawed his way back into the match — winning five of seven racks at one point to cut the lead to 8-7. After Van Boening won the 16th game to increase the lead to 9-7, Orcullo used safety play to win the next two racks to tie the match then broke and ran to take a 10-9 lead. 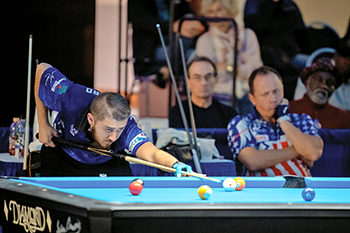 Standing at the table with the break and a chance to close out the match, Orcullo made the same error that his opponent had made 24 hours earlier against Ko — drawing the cue ball into the side pocket. "I made a ball every time, but I was just thinking, 'Avoid the scratch' in the last rack, and I scratched," Orcullo said. The South Dakotan cleared the table to even the score then executed sharp cut shots on the 5 ball and 7 ball to take the match. "I gave him six games. When I played in the very first games I had no rhythm, nothing at all," Orcullo said. "But I waited for my chance and I came back." Van Boening then defeated Sanchez-Ruiz, 11-6, to advance to the semifinals where he was eliminated by the red hot Woodward, who scattered five break-and-runs along with some stellar safety play to win 10 of 11 games at one point and sail to an 11-5 victory. "Sometimes you miscue and the momentum changes," Van Boening said. "Everything went on his side and he was breaking good." Originally named the U.S International Open when the event was announced earlier this year, the name eventually was shortened by Accu-Stats commentators to the International 9-Ball Open. Although the U.S. vanished from the title, it was prominent at the end on the leaderboard, with three of the top eight and four of the final 16 coming from America. In addition to Woodward's third place finish and Van Boening placing fourth, Bergman battled through the one-loss side for seventh-place honors. After convincing victories against Eric Bayhon, Rob Hart and Alex Kazakis, Bergman suffered an 11-4 defeat at the hands of Grabe. Shortly after the loss the two-time Mosconi Cup team member made his way to nearby Q-Masters Billiards to get some practice in before his next match with Thorsten Hohmann. "When I was practicing, I felt 10 times more confident than I had been," Bergman said. The confidence followed Bergman from the pool room back to the tournament, as the young man from Illinois rallied to defeat Hohmann, 11-6, Kevin Cheng, 11-8 and Shaw 11-7. The comeback hopes ended when Bergman faced old friend and Cup teammate Woodward, who used his punishing break to run six racks and easily defeat Bergman, 11-3. "I didn't really play well in the beginning, but I do feel like I played better towards the end," Bergman said. "In both losses my opponent put together a six-or-seven pack run on me." With the Mosconi Cup kicking off a few weeks after the tournament, Woodward and Van Boening's performances in the International might be a reason for hope among American pool fans. Add in the fact that the highest placing European team member was Shaw in ninth place and the hope could possibly be upgraded to guarded optimism – with one of the people feeling optimistic being Woodward. "It makes a statement. It says something that we can compete," Woodward said. Woodward had his best finish in a major 9-ball event, placing third and relegating Van Boening (seated) to fourth. There are, of course, no guarantees, but Pat Fleming probably had a fairly good idea of how the first International 9-Ball Open Championship would be received. After all, the former pro and founder of Accu-Stats Video Productions was hand-picked by the late Barry Behrman to run the U.S. Open 9-Ball Championships from 2015-2017. In addition to handling all of the live-streaming matches at the U.S. Open (something Fleming had done annually since the 1990s), Fleming oversaw the entire production of the U.S. Open over the past three years. Because of his knowledge of the event and relationship with the host Sheraton Norfolk Waterside Hotel, Fleming quickly announced the International to fill the sudden void created by Matchroom Multi Sport’s acquisition of the U.S. Open this past March and its decision to move the event to April 2019 in Las Vegas. 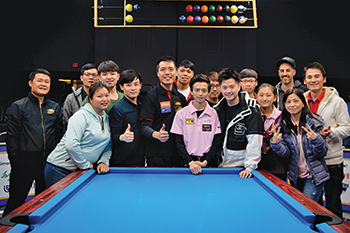 To his credit, the inaugural International 9-Ball Open looked and felt like the major event that East Coast pool fans had flocked to for 42 years. Only better. In essence, Fleming duplicated the U.S. Open blueprint and the International went off virtually without a hitch. Not everything was the same. Among the changes instituted in the International was referees racking for every game in every match. In the early stages, referees were assigned to a group of tables and were responsible only for racking. “I’ve never had more positive response from the players,” Fleming noted. “Even though these were not professional rackers and the racks were not always the same, the players liked that the racking was out of their hands. It was a big improvement. From the promotion side, the International featured more vendors and more sponsors than in previous years. The only hiccup that prevented the International from being a soaring success was the size of the field. After the U.S. Open pulled in 139 players in 2017, the International topped out at 113. With a field cap of 128 and an entry fee of $1,000, the prize fund featured $15,000 less than hoped for. And with first prize ($40,000) and last prize ($2,250 for 25-32) already announced, the shortfall came out of the middle of the prize fund. “I don’t know why there were fewer players,” Fleming admitted. “We only had six months’ notice for the event. Maybe that had an impact. But we already have the dates for next year (Oct. 27-Nov.2, 2019), so we have 12 months to promote. Most importantly, Fleming offered assurance that the International 9-Ball Open will have a home in Norfolk for the foreseeable future. Fleming (left, with runner-up Ko and presenter Ra Hanna) thinks the International will thrive in the U.S. Open's stead.